Today, as September comes to a close the last little taste of Summer is clinging to it. Even though the sun shone bright this morning, through the mist on the common, it was still so cold. Our breath hung in little icy moisture droplets above us as we waited for our cherry red bus to come. I love Summer and all it holds, but I love this time, when seasons change from one into the other and as the curtains draw on the final little bit of Summer and we kiss it goodbye, I welcome, with arms open-wide, all the best that Fall has to offer us. And one such thing is a bounty of gorgeous apples. I grew up on a farm and one of our staple crops were apples. There was nothing better than when my Dad, came home with the first of the year’s apple cider in frosty jugs for us to gobble down. Apples in season, meant ever-ready bushels of sweetness awaiting us. Thin sliced apples with crackers and hoop cheese, fresh frosty cider, my Dad’s applesauce for breakfast and my Mom’s apple butter spread over hot biscuits. Fall holds a sweetness to it all of its own, a beauty of color and taste. 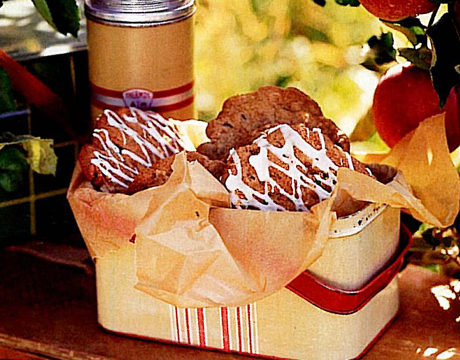 As we truly kiss the last of Summer goodbye and welcome in Fall, I found a recipe that I thought I would share with you, I have had cookies similar to this growing up and this was just something to delicious not to share! This entry was posted in Cooking and tagged apples, autumn, baking, cookies, country living, fall, family, recipes on September 29, 2010 by jennifermichie.